Elly Griffiths remains better known in her native England, but she’s been delighting readers stateside for many years with her highly acclaimed Ruth Galloway and Magic Men mystery series. A recipient of both the Mary Higgins Clark Award and the CWA Dagger in the Library Award, she’ll introduce new titles in each saga before year’s end. But first comes The Stranger Diaries—a standalone novel steeped in the gothic tradition. The book’s protagonist is high school English teacher and aspiring biographer Clare Cassidy, a single mother whose life is thrown into turmoil when her colleague and friend, Ella, is stabbed to death by person(s) unknown. The creep factor is further escalated by the knowledge that Ella’s killing appears to mirror elements of “The Stranger,” a favorite ghost story written by Victorian author R. M. Holland (Clare’s biographical subject), who once resided in the building where she now teaches. Detective Sergeant (DS) Harbinder Kaur (once a student at said school) and her partner, Neil Winston, are tasked with solving the crime; she is the “bad cop” to his “good cop” and enjoys confrontation. These aggressive tendencies may reflect an intrinsic need to continually prove herself to others. After all, she is a minority on three counts: she’s female, Indian, and gay—and lives (closeted) at home with her traditional parents. It’s no surprise, then, that she and Clare—who dotes on her dog, keeps a diary, and drinks wine—clash immediately. Georgie, Clare’s 15-year-old daughter, rounds out the story’s primary characters. Like all teens, she has secrets to keep—though her relationship with 21-year-old Ty is not one of them; despite their misgivings, both Clare and her ex tolerate the coupling for fear of what forbidding it might cause. Georgie’s stealth activities include nurturing literary ambitions of her own, and she and a group of her peers have been quietly studying the craft under the tutelage of Bryony Hughes, a so-called “white witch” who recently fell out with Ella. The narrative unwinds through these three first-person perspectives, which alternate and are offset by brief extracts from “The Stranger” (which is included in its entirety at book’s end) as well as excerpts from Clare’s diaries. It’s a highly effective approach in that it reveals the characters’ inner selves/vulnerabilities, often at odds with how they present themselves externally; this also allows for events to be processed through multiple points of view, affording readers information that may be known to one person but withheld from others. Consequently, the suspense intensifies as intimacies are formed. These relationship dynamics, and others, evolve throughout the story, which also heightens stakes. For instance, Clare and DS Kaur reach a tenuous truce, with the balance swinging in favor of friends rather than foes—though this is threatened as the body count rises steadily and suspicions fall uncomfortably close to home. Moreover, there’s the possibility that this “friendship” could be based on subtle (and mutual) manipulation. After all, bonding between a person of interest and an investigator is hardly casual. There’s no lack of suspects for Kaur’s consideration (beyond Clare herself). These include Rick Lewis, head of the English department, who has a history of pursuing his female colleagues romantically despite being married; Georgie’s friend, Patrick, who had a crush on Ella and was transferred out of her classroom; and the aforementioned Bryony Hughes, who’s at least guilty of being different. Hence, red herrings abound, some of whom will strike readers as more plausible than others. The solution itself is not entirely surprising, but those who have their sights set on the journey rather than the final destination should be satisfied. Overall, the book is deeply atmospheric—an achievement that can be partially attributed to Griffiths’s real-life inspiration; the school setting is based on West Dean College (and an attic staircase that’s said to be haunted), where she teaches creative writing. The melding of classical and contemporary stylings—tied together by “The Stranger” as well as repeated references to The Tempest—is also largely successful, though readers with a preference for one over the other might find that the narrative as a whole doesn’t surpass the sum of its parts. 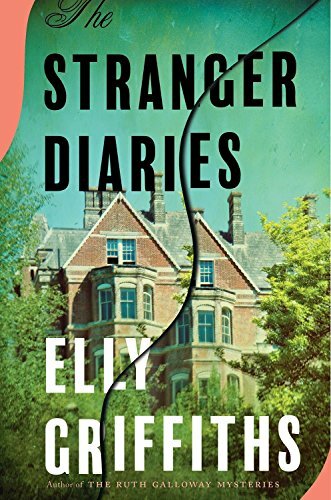 In its totality, The Stranger Diaries is an ambitious, evocative, and thoroughly tantalizing offering from an author who is not afraid to stray beyond her comfort zone. Fittingly, the book is more than a little unsettling—as all good hauntings should be. John B. Valeri is a writer whose work has appeared in The National Book Review, The Strand, Suspense magazine, and elsewhere. He also contributed to the fiction anthology Tricks and Treats (Books and Boos Press, 2016).